In the bowl of a stand mixer, whisk together warm water, yeast and honey. Allow to sit 5-10 minutes, until foamy. Using the dough hook, turn mixer on medium. Add salt, then slowly add flour, one cup at a time, until dough forms. Add one tablespoon olive oil and mix until incorporated. Add additional flour, if needed. Place a damn towel over the dough and allow to sit, 20-30 minutes, until dough has doubled in size. Preheat oven to 400 degrees. Remove dough from the bowl and transfer to a floured cutting board. Work dough into a nice ball, then cut into two balls. Working with one ball at a time, use a rolling pin to roll out dough to desired thickness. Place on a baking stone or baking sheet and brush with remaining tablespoon olive oil and sprinkle with salt. Bake for 8 minutes, until starting to brown. Remove from oven. Spread minced garlic over the crust. Repeat with second ball of dough. Heat oven to a low broil. In the meantime, in a medium mixing bowl, whisk together ricotta and lemon zest and juice. Spread mixture over flatbreads. 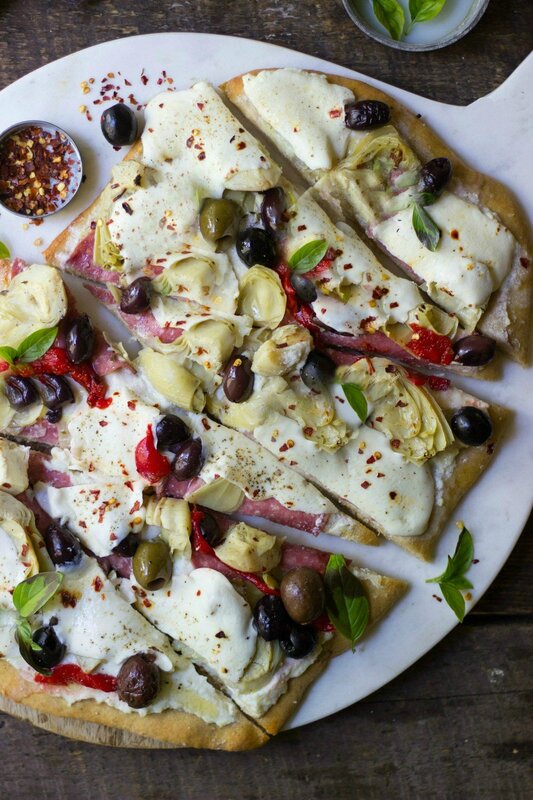 Top with salami, olives, artichokes and sliced mozzarella. Place under broiler and allow to cook 5-6 minutes, until mozzarella is melted and bubbly. Top with basil, oregano, black pepper and crushed red pepper flakes. Slice and serve.